Weeks after hearing those words, I packed up my life and moved from my hometown of Greensboro, North Carolina to Stillwater, Oklahoma to work as your National Publications Manager & Multimedia Designer. In this past year, I have had the opportunity to work with the incredible student and alumni leaders of Kappa Kappa Psi & Tau Beta Sigma. I’ve gotten to travel and meet brothers and sisters from chapters across the nation. During my travels, I have experienced many of the personalities and traditions that make chapters unique. Our dedication to the service of our college and university bands. I am a Spring 2003 initiate of the Iota Zeta Chapter of Kappa Kappa Psi at North Carolina A&T State University, where I participated in concert band, as well as, the award-winning Blue & Gold Marching Machine. 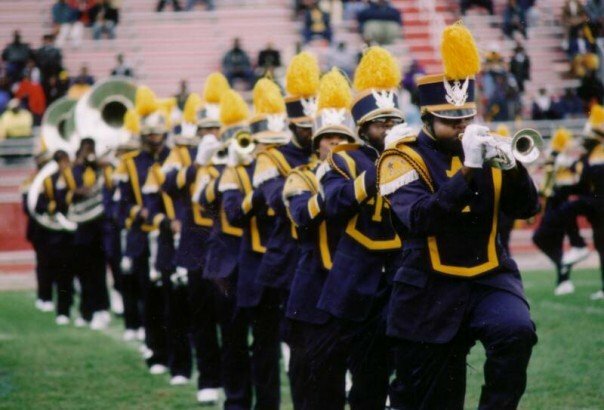 The HBCU (Historically Black Colleges & Universities) experience gives me a truly unique perspective of band culture and our organizations. Every chapter has its own way of doing things; but HBCU chapters seem like a very stark contrast to many. One must remember, however, that HBCU chapters are not monolithic. We are not all the same, yet we do share similarities in how we interpret our bond and express our love. These chapters are a testament to the diversity found within the tapestry of membership of our Fraternity and Sorority. The inspiration to write this particular article came from spending a bit of time with the Delta (ΚΚΨ) chapter during a trip to Purcell, Oklahoma. I was accompanying ΤΒΣ Board of Trustees member, Lisa Croston, to get some shelving for the National Archives at HQ. The brothers of Delta helped with loading the shelving into the truck and were rewarded by Lisa with drinks of their choice from Sonic. While we sat outside, they talked about how they go about their band service and other stories from behind the scenes of their band program. When I listened to them, they reminded me of my active days. It felt very familiar. The University of Oklahoma and North Carolina A&T State University are two very different locales with completely different styles of bands; yet a lot of the same support and love for our band programs is required. But it’s not just the service – It’s also the fellowship. For example, I was able to attend the North Central District Convention this past March, my first district convention outside of the Southeast District. It was a different culture, but a very similar passion for their bands and their chapters. I really enjoyed talking with all the brothers and sisters of the NCD. One of my favorite moments was, immediately after the banquet, when all the chapters circled up and performed their chapter/school songs and chants. It was somewhat déjà vu for me, as the previous weekend at the SED Convention I witnessed a similar scene. In that moment, I didn’t see them as a different district, but rather as an extension of what I already knew and loved. Every chapter is different, yet shares the same goal and purpose. Differences are mere seasoning that gives greater flavor to the overall bond we share. As a Headquarters staff member, I bring a perspective that has never been seen before in the office. I can provide insight, and help people better understand many aspects of HBCU band culture that no one else in the office has experienced. By keeping an open mind, an exchange of knowledge can occur where all parties are enlightened: celebrating differences, appreciating similarities. I encourage all chapters to strive to take every opportunity to fellowship with other chapters, especially those from different backgrounds, with open minds, listening ears, and extended hands. Get outside of your regional and/or cultural bubbles and explore. Seek and create opportunities to make new connections. Encourage all your chapter members to attend district and national conventions. Make it a point to meet people from all kinds of different backgrounds. Encourage that within your band program as well! Maybe even create a moment through joint performances with other band programs (i.e. University of Houston & Grambling State). Learn and grow as people, bandsmen, and a member of these fine organizations! OBSERVATION! is the last word from the Publications Manager to close The Podium print magazine. It is a throwback to the “Last Word” feature from vintage issues of The Podium.